SHARK!!!!! !, originally uploaded by bill kralovec. 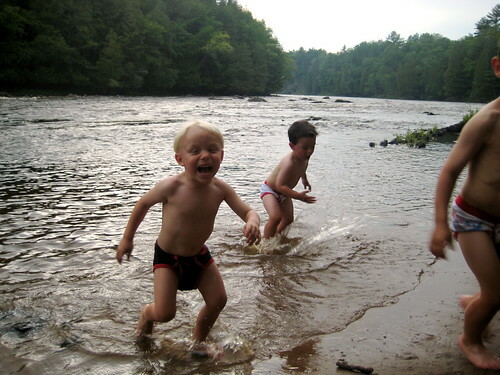 The boys are running out of the Menominee River in terror. They spotted a rare Northern Freshwater River Shark that roared its teeth. Our vacation continues and we had a great day yesterday. Wrapping up the 4th of July holiday weekend, we first went to the pancake breakfast at the Stambaugh American Legion post. My father is a member as he served in the US army during the occupation of Germany after WWII. We then drove to Iron Mountain and purchased toiletries for Serbia next year. After the hell of WalMart, Jimmer and I took the boys to the Piers Gorge Protected Area. This is a section of the Menominee River that features rapids and cliffs and old growth white pines. Absolutely beautiful and one of my favorite places in the Upper Peninsula. We hiked to a beach area and as you can see from the photos on our flickr account, the kids had a great time. Kids are up, have to go.